Then in 2008, Washington attended a six-month program with The Center for Agroecology and Sustainable Food Systems at the University of California, Santa Cruz. “When I told people, ‘I’m going to California to become a farmer,’ they looked at me like, ‘What? You’re a black person, and you’re going to farm?’” Washington says the people around her were incredibly supportive and made the remarks only as jokes, but she says she heard all the stereotypes: from picking cotton, to working for the man to doing slave labor. Upon her return to New York, she and some friends founded the Black Farmers and Urban Gardeners Conference. As an activist and community organizer, Washington has been part of numerous initiatives. 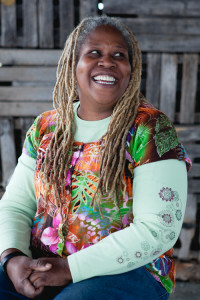 She’s served as a community gardener and board member of The New York Botanical Gardens, a member of La Familia Verde Community Garden Coalition, a board member and trainer with Just Food, a co-founder of Black Urban Growers (BUGS) and many others. Washington has an activist’s charm, with an engaging personality and the ability to talk about the complexities of injustice in a digestible way. She also understands how to reach communities. She also emphasizes seeing the bigger picture. Washington notes that she sees too many people stuck a cycle of relying on what should be “temporary and emergency programs” such as soup kitchens and SNAP and advocates reevaluating these programs to mobilize people with jobs and resources instead of fostering dependency. Washington is well aware of the difficulties that people of color, as well as young people, face as they try to break into farming and challenge old stereotypes of who represents the “American farmer.” And with the average age of the farmers in the U.S. resting at 57, developing more young farmers is imperative. Washington remarks that, as a woman of color, buying land was one of her greatest challenges. However, she and a small group of women were able to secure land in 2014. They founded Rise and Root Farm in Orange County, NY, where she now lives part time. At Rise and Root, the tagline is that the farmers “traded in metro cards for tractors.” Arriving from the city, Washington and her fellow farmers initially faced skepticism from local farmers. They implemented urban techniques in a rural setting, such as building beds on the land and installing drip tape. The neighbors laughed, she recalls.